The Isabella Stewart Gardner Museum in Boston, popularly known as The Gardner, houses the art collection of Isabella Stewart Gardner. Throughout her life she collected and carefully displayed a collection comprised of more than 2,500 objects from paintings to rare books from ancient Rome, Medieval Europe, Renaissance Italy, Asia, the Islamic world and 19th-century France and America. Isabella Stewart Gardner (1840-1924) was a gutsy woman way ahead of her time in her thinking. She was vibrant, well read, and interested in everything and everyone around her, from art to music to horse racing to cheering on her beloved Boston Red Sox. She built her home, Fenway Court, as a museum to house her stellar collections of art. The other day, while I was standing in the new 70,000 square foot Renzo Piano designed addition to the Isabella Stewart Gardner Museum I couldn’t help but think how she would heartily approve of it. The building is drop dead gorgeous, just Isabella’s style. I’ve read extensively about Isabella’s life, how she came from a wealthy New York family, Isabella Stewart was 20 years old when she married John Lowell Gardner, Jr., scion of an old Boston Brahmin family. From then on she would be known in the society pages as “Mrs. Jack”. She was not accepted socially by the Boston Brahmins of the 19th century. She had three strikes against her; she wasn’t from Boston, she was educated in Paris where she developed a taste for what was considered “outrageously elegant fashions, ” and, more importantly, the Stewart fortune wasn’t old money that descended through generations as it did in her husband’s family; the Gardners, Peabody’s, Lowells and Endicotts. Isabella turned a deaf ear to all the gossip about her, hosting elegant parties at their Beacon Street home that members of Boston society clamored for invitations to. She became a patron of the arts taking under her wing writers and artists such as Henry James, Francis Marion Crawford, James McNeill Whistler and John Singer Sargent, introducing them to all the right people that she knew could further their careers. The Gardners took their first trip to Europe in 1865 after the death of their two-year old baby son, Jackie. As a way of soothing her grief Isabella threw herself into learning about and collecting great art. On their many trips around the world they amassed a priceless collection of 2,500 artifacts of statuary, art and decorative pieces from China, Japan, Egypt, France, and Italy. Her works of art, dating from the 15th to the 19th century, include El Jaleo by John Singer Sargent, Death and the Assumption of the Virgin by Fra Angelico, Peter Paul Rubens’ Portrait of Thomas Howell, 2nd Earl of Arundel, Portrait of Madam Auguste Manet by Edouard Manet and Titian’s Europa to name a few. While in Venice they always took up residence, for months at a time, in the Palazzo Barbarro. There they would visit galleries buying art and attend operas and theater performances. When Jack Gardner died in 1898 Isabella purchased land in Boston’s Fens area and built her home, Fenway Court, now the Isabella Stewart Gardner Museum. She spared no expense hiring renowned Boston architect Willard Sears and was involved in every aspect of the building process; from instructing Sears to design it to resemble the Palazzo Barbarro, to climbing ladders to show how she wanted her paintings hung to working with Italian and Spanish designers in the selection of the floor tiles. She had many of her Paris gowns re-designed and used them as backdrops for her paintings. On New Year’s Day 1903 Isabella opened Fenway Court to the cream of Boston society. In the way she did everything, the opening was a gala with the Boston Symphony Orchestra playing in the music room, and guests sipping champagne while they mingled amidst her fabulous art. In 1914 she added the massive Tapestry Room to display her collection of 16th century Flemish tapestries. Since the 1970’s the room has been used for lectures and concerts with cramped seating elbow to elbow. With the new Renzo Piano designed wing, the Tapestry Room has been restored to its original grandeur. 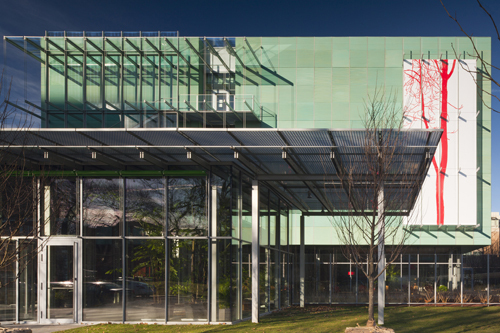 Front entrance of the Renzo Piano wing, view of Ailanthus artwork by Stefani Arienti - Image courtesy of Nic Lehoux for Renzo Piano Building Workshop & Isabella Stewart Gardner Museum. 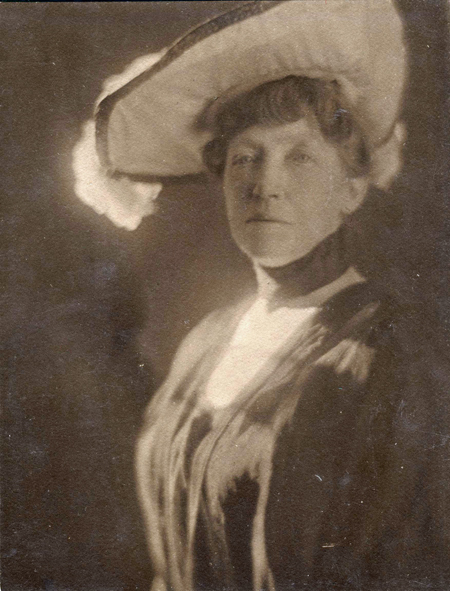 On her death in 1924 Isabella bequeathed a million dollar endowment for the preservation of her museum with a restriction that none of her collection be changed. Fast forward to the 21st century and, in order for the museum to survive, it needed to grow. Since 1999 Anne Hawley, the Norma Jean Calderwood Director of the museum, has worked with Italian architect Renzo Piano in overseeing the creation of the addition while honoring Mrs. Gardner’s wishes. Today, the “palace” as the main museum is called, shines even more beautifully with the new wing. Just like Isabella did in building her museum, no expense was spared, $114 million, in this design. At the January 19th opening of the wing, architect Renzo Piano talked about his work “This was not an easy job; we could not compete with the magic of Mrs. Gardner’s palace. The palace is a very fragile building that survived for a century this new building will help it to survive for another century”. Nothing in Isabella’s museum was disturbed, Piano made the connection of the new wing to the palace seamlessly with a 50-foot long glass corridor that he surrounded with a landscape of American hornbeams and lacebark pines. Calderwood Hall Performance Center seats 300 in tiered balconies. 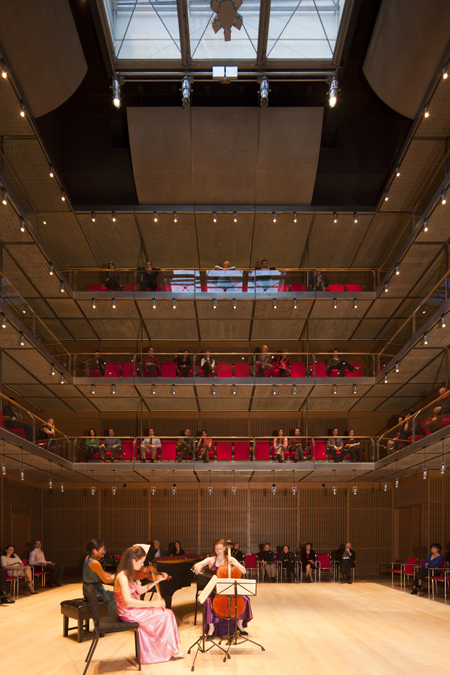 The Alaskan white oak floors and yellow cedar walls allow the acoustics of the hall to embrace the performer – sharing the experience with the audience. Renzo Piano took into consideration the small theaters throughout Italy, particularly the Spoleto Theater in Perugia for their tiered effect when he and noted theater designer Yasuhisa Toyota designed the hall. This wing doubles the space of the curatorial areas with an education studio, a multi-use learning space for people of all ages; the greenhouse with its rare plants is where landscape lectures will be held. The living room’s floor to ceiling glass walls and minimalist furnishings designed by Piano offers an oasis for relaxing. In honor of Isabella being a patron of the arts, The Gardner has, for twenty years, offered an artist in residence program. Now it can honor those who participated in it with exhibits of their work. The Special Exhibition Gallery, with 1500 square feet of space and a glass wall measuring three stories high is an ideal setting for art. The opening exhibit, Tapestry, Radio On is a series of abstracts in bold blues, greens, yellows and oranges by Scottish artist Victoria Morton, a former Gardner artist in residence. The small exhibit space that you pass through to get to Morton’s exhibit is given over to more works by former members of the artist in residence program. Of note is a beautiful but sad painting of Mrs. Gardner in her frail later years done by her great friend John Singer Sargent, the first artist to reside at Fenway Court. In designing the new wing Renzo Piano displayed reverent sensitivity to Isabella’s palace, placing the addition so that the palace is seen from every angle. He has paid homage to her and the magnificent Isabella Stewart Gardner Museum. From what I’ve read about Isabella I feel that she would love that this wing is allowing her palace to grow so that it continues to support the arts and artisans. Guest writer Frances J. Folsom lives and writes in beautiful New England. She has written for many print magazines and has contributed to a range of travel guides. Frances can be reached by e-mail or through her personal blog. She lives in Cambridge Massachusetts.